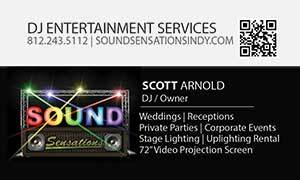 Scott is the owner and DJ for Sound Sensations. Scott has been a professional wedding disc jockey for over 16 years. He typically uses a very laid back approach when it comes to how much time he spends on the microphone. He doesn't use any goofy props, tell any jokes, or tries to turn himself into the star of the show. He never double books and is always the DJ at your booked event. Scott makes his necessary announcements and leaves the rest of the time and attention to the bride and groom. When it comes to the dancing part of the evening, Scott will focus his attention on the dance floor; those that are dancing, and those that are not. By paying particular attention to the re actions he gets by each song played, he will be able to get to know your guests and their music preferences. He will then be able to cater his music selections to your family and friends so that all can enjoy and celebrate your union by dancing the night away.